Knoco stories: What's the "white space" occupied by KM? What's the "white space" occupied by KM? One of the issues involved in developing the ISO standard for Knowledge Management has been the definition of the "White Space" KM occupies. After all, if Knowledge management is to add any value as a discipline, it must cover areas not already covered by other disciplines. This was the main thesis of "The Nonsense of Knowledge Management" by TD Wilson, who argued that KM was partly or completely a rebadging of Information Management, and therefore a fad invented by management consultants to make themselves rich (I wish!). Knowledge Management must occupy a space of it's own, surrounded by (but not totally overlapping with) other disciplines. 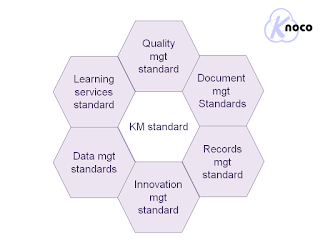 So when it came to defining the scope of KM for the forthcoming ISO standard, one of the things we looked at was existing standards for existing disciplines. Again, if a KM standard is to add value, it can't be a rebadging of an existing standard. Similarly there are ISO standards for non-formal training and learning, and for content management as it applies to product documentation. In between these existing standards though there is some white space for KM. There are no standards that address the disposal of old knowledge (which sometimes is more dangerous than no knowledge at all). So there is space for Knowledge Management as a discipline; namely a discipline based on Knowledge, rather than on information and documents; which recognises that some knowledge may be transferred or retained in documented form, but which addresses the contents of the document rather than the way it is handled as a record. That is the discipline which we should shortly see released in the draft Knowledge management standard: ISO 30401. I will let you know when it is released, so you can view and comment on the standard, ready for the next phase of committee work.